Gov. Jerry Brown introduced his $122.6 billion general fund budget in Sacramento on Thursday, including a new approach to replacing a soon-to-expire tax on managed care organizations. The present MCO tax will end on June 30 if legislators cannot agree on a replacement. California faces the loss of $1.1 billion in revenue, including federal match funds. A plan launched last year during a special legislative session on health did not advance. Brown is now proposing an overall reform package on taxes insurers pay that he says will ultimately save them money. "It's lowering the corporate tax, lowering the premiums tax," Brown said, "and you blend all that together. Because of the way the federal government works, money can flow to us, and it will be net for California." Brown said he hoped to get the issue resolved "in a month," but stressed there was no deal as yet with the health plans. The Budget also assumes that revenues from the tax be placed in a special fund and be used to restore the 7‐percent reduction to the In‐Home Supportive Services ($236 million annually). Finally, the Budget assumes the tax is in place for three years starting in 2016‐17. Charles Bacchi, California Association of Health Plans CEO, said he appreciated new options on an MCO tax. "I think they've been working very hard, and certainly credit is due to them. At this time, we're still looking at it. We're still trying to confirm it. There will be more discussions this week with the administration." Some are already critical of the proposed plan, which earmarks some of the MCO revenue to the Department of Developmental Services. Tim Hornbecker, director of business development for The Arc of Alameda County, believes tying developmental disabilities funding to the MCO tax is the governor’s way of garnering Republican support for the tax -- he needs a two-thirds vote from the Legislature for the tax to pass. “The governor is using people with developmental disabilities as pawns in the system, until he can get his votes from Republicans,” Hornbecker said. Assemblyman Tom Lackey, R-Palmdale, did not approve of the approach. The budget includes a 2.8 percent increase in benefits for people who receive Supplemental Security Income/State Supplementary Payment (SSI/SSP). An estimated 1.3 million people are expected to receive monthly benefits in 2016-17, and their maximum grants will be $889 per month for individuals and $1,496 per month for couples, an increase of $17 and $31 respectively. The state's Medi-Cal enrollment is expected to reach a new high in the next fiscal year -- 13.5 million people, or more than a third of all Californians. California expanded Medi-Cal as part of the Affordable Care Act. The federal government has been paying 100 percent of the cost of those in the expansion population, but in 2017, California will be responsible for 5 percent of that cost, or $740.2 million in general fund money. The state is responsible for half the cost of those who were always eligible for Medi-Cal but did not sign up until the Affordable Care Act went into effect. Next year, that's expected to be $1.9 billion from the general fund. On May 1, 170,000 undocumented children will become eligible for full Medi-Cal benefits. California is the first state in the country to cover undocumented children. The governor earmarked $145 million in general fund money to cover the new costs. While advocates noted there were no new cuts to programs, they were disappointed that the governor did not go further in restoring funding that was deeply cut in the wake of the 2008 recession. "This budget proposal largely continues the recession-era cuts to health and human services," Anthony Wright, executive director, of Health Access, an advocacy group, said in a statement. "The [budget] surplus was created in part from $15 billion in HHS cuts; it's high time to restore cuts to Medi-Cal benefits and rates and other public health programs." An earlier version of this story incorrectly quoted Gov. 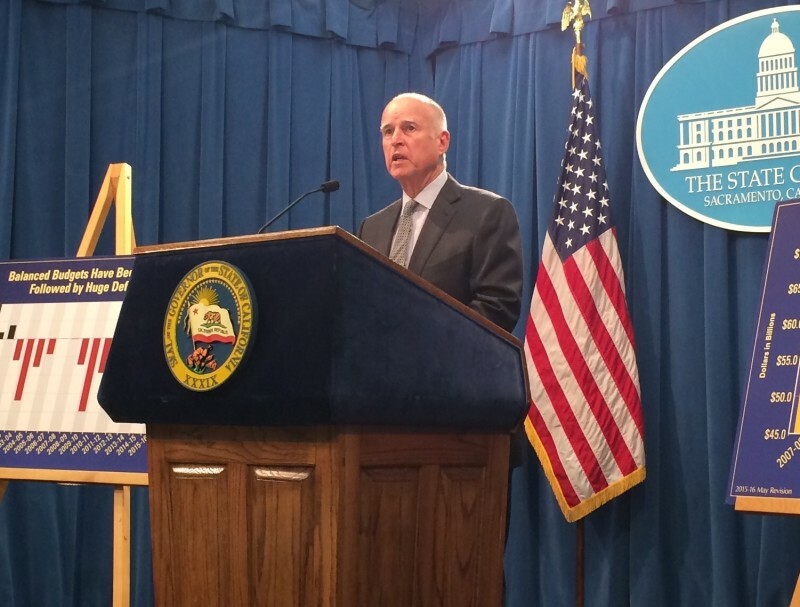 Brown who said his revised MCO plan would be "net for California" not "net positive." KQED regrets the error.